Recorded in a cold, isolated cabin in Wisconsin, this debut by Justin Vernon's Bon Iver is rich in wintry intimacy and frosty atmospherics, charting the solitary sounds of a writer in quiet self-reflection. 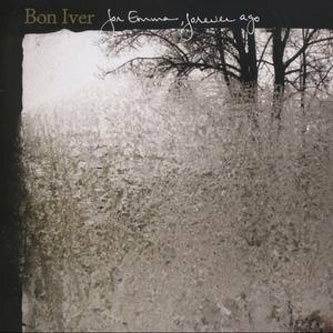 Much has been made of the circumstances that led to this album's composition and recording, and it's inevitable that the imagery of isolation should feed into how the album is digested - even the name Bon Iver is a corruption of the French for 'good winter', further compounding the album's snowy pedigree. Although in essence opener 'Flume' is a simple acoustic ballad, the song is bolstered greatly by layers of echoing texture and bristling guitar string overtones, and it's these kinds of textures that elevate the album beyond the normality of singer/songwriter-dom. There's a comparison to be made between the multitracked vocal compositions that illuminated last year's Phosphorescent album, Pride, and pieces like 'Lump Sum', which opens with a reverberant canyon of choral layering. Funnily enough, just as with that Phosphorescent album, one of the finest tracks here is called 'Wolves' (clearly these two are kindred spirits) although the Bon Iver song is rather more rambunctious than its counterpart, featuring a clattery, out of time drum kit, building up to an outright dirge. Back to those vocals: for an otherwise conventional troubadour type setup Justin Vernon's delivery is quite unusual; he has more in common with TV On The Radio or crikey - even the Bee Gees, such is his polyphonic falsetto. It really instils a sense of character in the record, and most of those atmospheric touches come from the voice rather than elaborate instrumental work, in fact, the vocals have to carry most of the album - aside from a little brass, on 'For Emma' and the occasional smattering of percussion here and there, Vernon's only real instrument is a simply strummed acoustic guitar. Despite such humble arrangements the album succeeds as a highly memorable, evocative listen. This will be massive - and deservedly so. Highly Recommended.